Boil almonds in water and peel. Divide them in half. Make slivers with one half and coarsely chop the other half. Fry both halves separately. Cut up a hen dividing it at the joints. Put the pieces in a pot. Add vinegar, cilantro juice, oil, mashed cilantro leaves, ½ onion chopped, coriander seed, cumin, ¼ tsp pepper, ½ tsp cinnamon, fennel stalks chopped, citron leaves chopped, the coarsely chopped ground pine kernels. Cover with water. Cook over moderate heat. Grind the lamb, removing veins, and divide in half. Mix the first half with ¼ tsp white pepper, ½ tsp cinnamon. Roll in ¼ c flour. 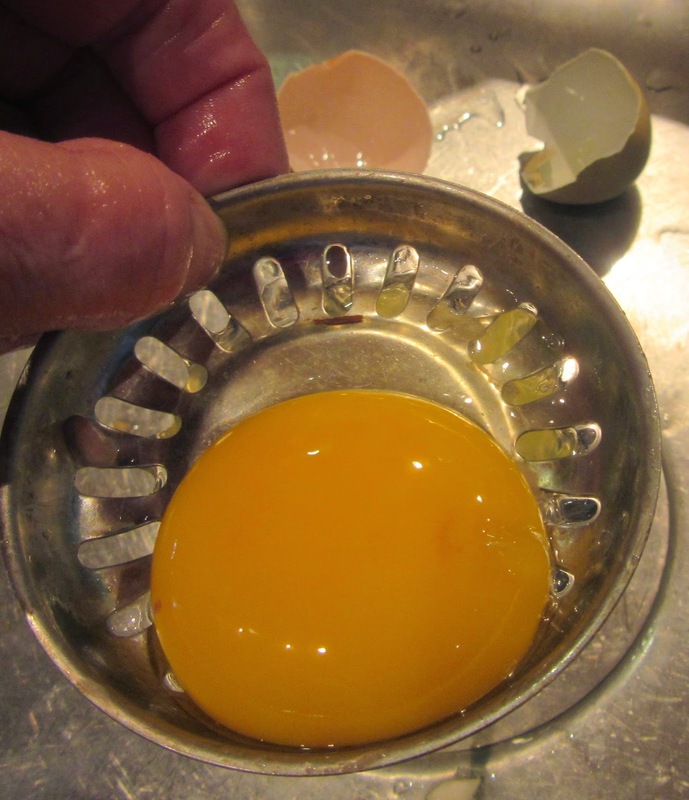 Dip in 1 sm egg slightly beaten and add them to the pot with the chicken. Reserve the left over egg and flour for the other half of the lamb. Mix the other half of the ground lamb and make meatballs. Coat with flour and then dip into the slightly beaten egg. 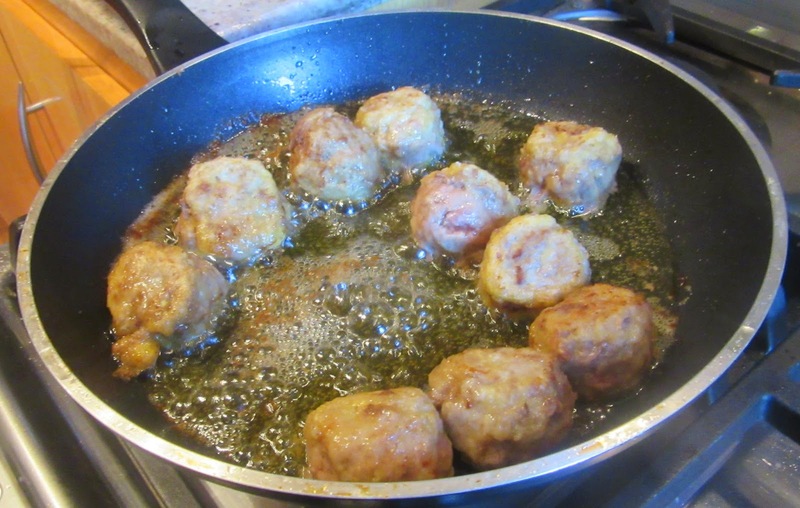 Fry these meatballs in olive oil. When the chicken is cooked, remove it from the pot. Let cool enough to debone it and dice the meat. Put it into a greased casserole with the remaining solid ingredients from the pot. Cover these with the other half of the meatballs. Garnish with almond slivers and raw egg yolks. Bake in oven until egg yolks are set. Serve, God willing. Se corta la gallina, articulación por articulación, se limpia y se pone en una olla; se la echan dos cucharadas de vinagre y otros de zumo de cilantro, tres cucharadas de aceite, cilantro verde majado con media cebolla, cilantro seco, comino, pimienta, canela, palos de ruda, ojos de cidra, almendras, piñones descascarillados y lo bastante de agua; se cuece sobre brasas moderadas y se toma carnes de cordero, que se maja bien y se pone en ella todo lo que se pone en las albóndigas, según lo que antecede; se hacen con ella albóndigas pequeñas y se cuecen con la gallina; se separa algo de esta carne para espesar con ella la olla, y si quieres freír algunas albóndigas, las fríes; luego le cascas lo que quieras de huevos y los bates con la carne de las albóndigas, que has separado, y con un poco de harina blanca, una cucharada de zumo de cilantro verde y algo de pimienta; se espesa con ello la olla y entonces se adornan las almendras en la fuente con las albóndigas y yemas de huevo y se presenta, si Dios quiere. Cut up the hen, joint by joint, clean it and put in a pot; throw in two spoons of vinegar and the same amount of cilantro juice, three spoons of oil, cilantro pounded with half an onion, coriander seed, cumin, pepper, cinnamon, stalks of fennel, "eyes" of citron leaves, almonds, shelled pine-nuts and enough water; cook over moderate coals and take lamb's meat, pound this and place in it everything that goes into meatballs, according to the preceeding. Make with this little meatballs and cook with the hen; reserve some of this meat to cover the contents of the pot with, and if you wish to fry some meatballs, fry them; then break as many eggs as you like and beat them with the meat from the meatballs, which you reserved, and with a little white flour, a spoon of cilantro juice and some pepper; cover the contents of the pot with it and then arrange the almonds in the platter with the meatballs and egg yolks and serve, God willing.